Ottawa, October 5, 2010 – The physical effects of climate change on Canada in the next century could touch everything from human health and community infrastructure to water resources and even tourism and recreation activities, according to a newly-compiled presentation of scientific research published today. 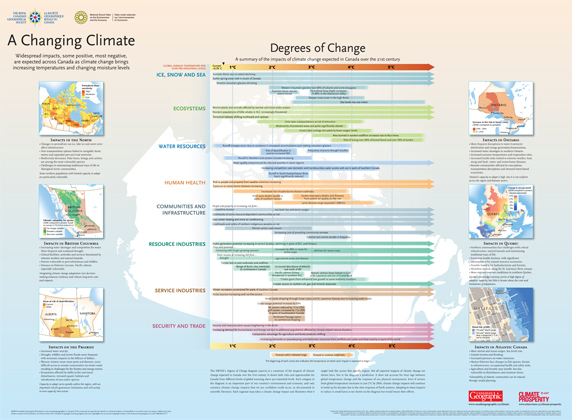 Called Degrees of Change, the diagram is the first comprehensive illustration of expected climate impacts published for Canada and appears today in editions of Canadian Geographic and Géographica magazines. Resting on a large body of published scientific information, it lays out 60 specific effects of climate change at increasing levels of warming as part of a joint initiative between the National Round Table on the Environment and the Economy and the Royal Canadian Geographical Society. At two-degrees warming, for example, the diagram shows that summer Arctic sea ice extent could be halved, runoff in the South Saskatchewan River basin significantly reduced, and shipping through the Great Lakes and St. Lawrence Seaway could become more costly due to lowering water levels. The two-degree marker represents temperature increases over pre-industrial levels and is significant because Canada and other G8 nations have agreed to take measures to limit global temperature increases to no more than that level. The diagram and feature articles in the magazines go on to show even more risks to Canada’s coastal communities, fish and wildlife habitat, and human health, if global temperatures rise beyond the two-degree point. Not all impacts compiled in the diagram are necessarily negative. For example, a two-degree increase could see timber gains from enhanced tree growth in some northerly locations, greater access to northern oil, gas and mineral resources, and an increased abundance of Atlantic cod north of the 60th parallel. Some tourism and recreational pursuits, such as skiing, would likely be hurt while others, such as golf, could benefit. The diagram is meant to illustrate a range of possible impacts that are scientifically-accepted and projected at this time. Besides the magazines and poster diagram, the RCGS and NRTEE will sponsor expert panel discussions and have collaborated with the RCGS’ Canadian Council for Geographic Education to produce an education resource package to be distributed to 12,000 middle and secondary schools across Canada highlighting the implications of regional and local impacts of climate change. The RCGS Canadian Atlas Online (CAOL) will also carry a dedicated module on Climate Prosperity with interactive maps, diagrams and 13 lesson plans in the CAOL Learning Centre. Dealing with the impacts of climate change means educating our children, said RCGS President Gisèle Jacob. To generate a national conversation on the impacts of climate change and potential solutions, the two organizations are hosting a series of panel discussions with leading Canadian experts over the next two weeks. The first will take place today from to 2 p.m. to 4 p.m. at the Canadian Museum of Nature. Regional sessions will take place in Halifax on Oct. 13th, Montreal on Oct. 14th, Toronto on Oct. 18th, Vancouver on Oct. 20th and Saskatoon on Oct. 21st. “Adapt and prosper will be increasingly central to Canadian governments, communities, and businesses as these effects become more and more evident,” said NRTEE President and CEO David McLaughlin. This evening, the two organizations will host a reception at the Canadian Museum of Nature, where His Excellency the Right Honourable David Johnston, Governor General of Canada will speak. Also speaking will be federal Environment Minister Jim Prentice. Astronaut Dr. Robert Thirsk will provide a video message in support of the initiative. His Excellency is the founding chair of the National Round Table on the Environment and the Economy. Media are welcome to attend both the panel discussion and speeches at tonight’s reception. The bilingual diagram is available both in print and online through Canadian Geographic, Géographica, and the NRTEE. Begins at 5 p.m., speeches at 5:30 p.m.
*Media are welcome to cover the public portion of the event which ends with the conclusion of the speeches.